The Marine Room continues to entice guests from around the world, as connoisseurs and critics recognize our unique beachfront setting paired with an award-winning menu of globally-inspired ingredients with a fine art presentation. We have won 100+ awards for our view, including Open Table's 100 Most Scenic Restaurants in America (2011-2017), AAA Four Diamond Rating (2013-2018), and 73 Awards since 1996 including Most Romantic, Best Special Occasion, Best Chef, Best View, and Best Service from San Diego Magazine. 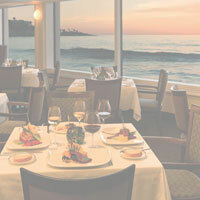 Check out our press clippings and articles for an inside look about what's happening at The Marine Room and upcoming events to see why we are voted the best restaurant in La Jolla year after year. If you require additional information and/or photography, please contact The Marine Room's Marketing Department at (858) 551-4639 or [email protected]. Thank you for your interest! Twenty Most Romantic Restaurants in the U.S.